Apparently Jehuda is a really great place to hang out during the day and relax over a cup of coffee. Personally that’s not how I remember it. In fact, I’ve a hard time remembering any specific details about this wonderful bar despite having been there plenty of times. Mainly it’s because I visit Jehuda only later in the evening when the normally straightforward street grid of Vinohrady starts blurring into an impossible maze. There are two things that you need to do immediately after stepping into the dimly lit bar. Well, first you might need a second or two until the cigarette smoke settles down and your watery eyes regain their sense of vision. 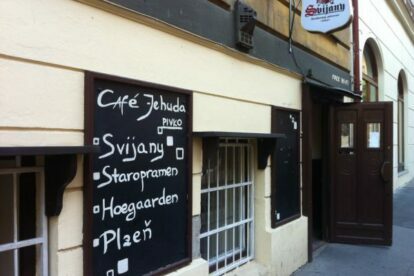 Then, however, you shall order Svijany, which no matter what anyone says is the uncrowned king of Czech beer, and a nakládaný hermelín (pickled cheese), which I can only describe as “to die for” (while drooling uncontrollably). Now that we have gotten the two main reasons for visiting Jehuda out of the way, you are left with a cozy bar with wood clad walls, old-timey framed pictures on the walls and tables made of old sowing machines. In the corner you’ll see a heart-shaped alcove in the wall as if made for that couple on their first date. And while I’m not sure that taking a crush to Jehuda would ever grant you a second date, you can always lift your spirits by talking to the crowd of passionate regulars while eating that pickled cheese.